1.4 quart sharps mail-back disposal system. 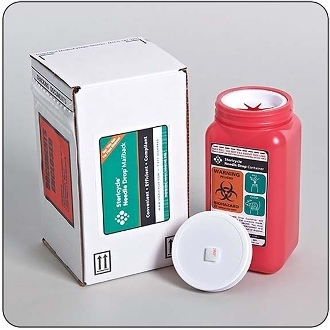 This 3.5" x 3.75" x 8" container holds approximately 42 3cc syringes. Each registered system includes outbound shipping, container, liner, liner tie, instructions, tape, return shipping box, manifest paperwork, return shipping, proper disposal and certificates of destruction.